Razor Travel Case (case delivered without the razor). Travel case compatible with most razors. Excellent complement when travelling or just to keep safety your razor. Mühle DE Safety Razor Blade Guard. The blade guard made of plastic protects the blade and prevents from cuts when storing the safety razor or while traveling. Works for all MÜHLE double edge safety razors with open and closed comb. Edwin Jagger Black Travel Case DE Razor. Razor Case, specially designed by Edwin Jagger. 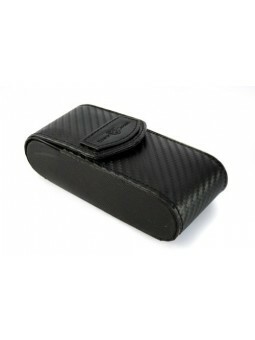 Black carbon fibre effect material with Edwin Jagger embossed with logo. 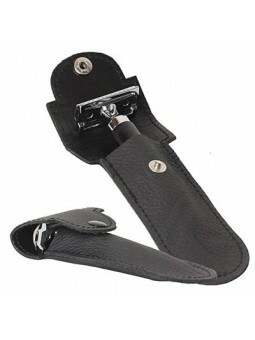 It closes with magnetic stud fastener, with capacity compartment for razor and spare DE blades. 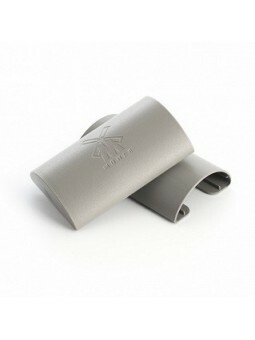 Ideal to protect and carry your razor while traveling and always keep it in perfect condition. Case dimenssion: 10cm height and 5 cm width. Fits Edwin Jagger Premium DE razors and other brands. Case only; no razor or blades included. Epsilon Safety Razor Leather Pouch. Black, handmade safety razor pouch. It fits most double edge safety razors on the market. This product does not include the razor shown in the picture. 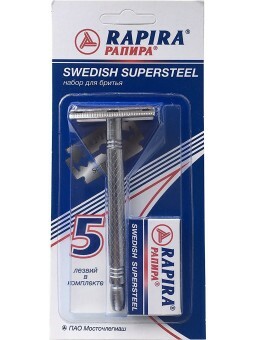 Rapira Double Edge Swedish Supersteel Safety Razor. 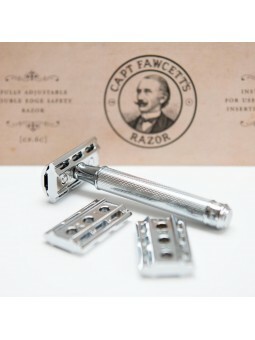 A 3 piece safety razor offered with a pack of 5 Rapira Swedish Supersteel Double Edge Blades. The blades are offered in individual packs of 5 DE blades. DE blade is wrapped individually. 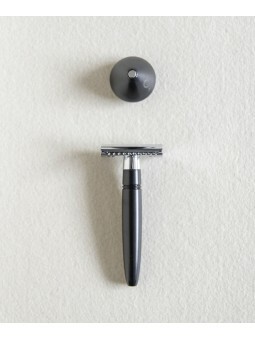 Oksson Black Safety Razor. This razor has a black handle and base made of solid brass. The best material for a razor that provides weight and perfect resistence. The Oksson razors are made with CNC technology, giving it an extreme precision for finishes and tolerance. This is a product with a patent and with the licences that are in accordance with intellectual properties. The magnets allow to leave the razor in a vertical position, ensuring that the blade never touches the sink. 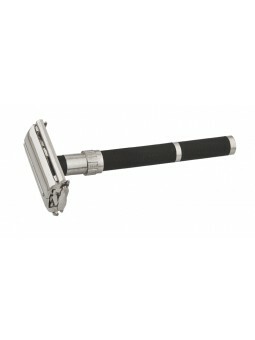 It has the perfect weight and balance to adapt to the movements when shaving. Once shaving is finishes, dry the magnets with a towel. Leave the razor on its base very carefully to avoid damaging the magnets. Oksson works in collaboration with Edwin Jagger, combs providers since 1988. Each Oksson razor comes with 5 Feather blades, the best ones on the market. Oksson White Safety Razor. This razor has a white handle and base made of solid brass. The best material for a razor that provides weight and perfect resistence. Paradigm Single Blade Razor. The Paradigm SE Titanium razor is machined in flyover country right in the heartland of the United States. 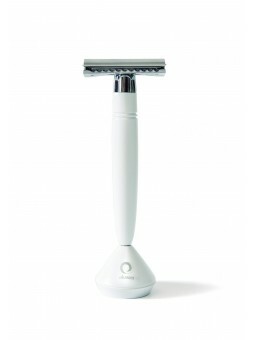 The fit and finish is superb and the shave is nimble and efficient while still being gentle. The Paradigm SE razor has tamed the notoriously aggressive Artist Club blade. It has a mild feel, yet still efficiently plows down the whiskers. The mild and efficient shave enables shaving against the grain even in difficult places or for those with sensitive skin. It is a two piece design, with a unique slide off cap that makes blade changes simple. It weighs in at a perfect 80 grams, and in spite of its substantial size is highly maneuverable. It has been manufactured in a limited special edition of only 150 units in the world. Possibly the most exclusive razor in the world. The razor is used with singe eldge Blades. Suitable for all Kai Kasho and Feather single Edge Blades. If any voucher is applied, we will unfortunately have to refuse the order. The Parker 111W is a classic safety razor, reminicent of those which were popular in the U.K. many years back. High quality components, a timeless look and a precision engineered razor head all make this a wonderful razor for both new and seasoned wet shaving enthausiasts. The Parker 111B is a classic three-piece safety razor, reminicent of those which were popular in the U.K. many years back. High quality components, a timeless look and a precision engineered razor head all make this a wonderful razor for both a new and seasoned wet shaving enthausiasts. Parker 96R Safety Razor offers the butterfly safety razor opening design to replace double edge blades. Long non-slip black colour graphite handle.